Over a year ago I came across a kickstarter that piqued my interest. 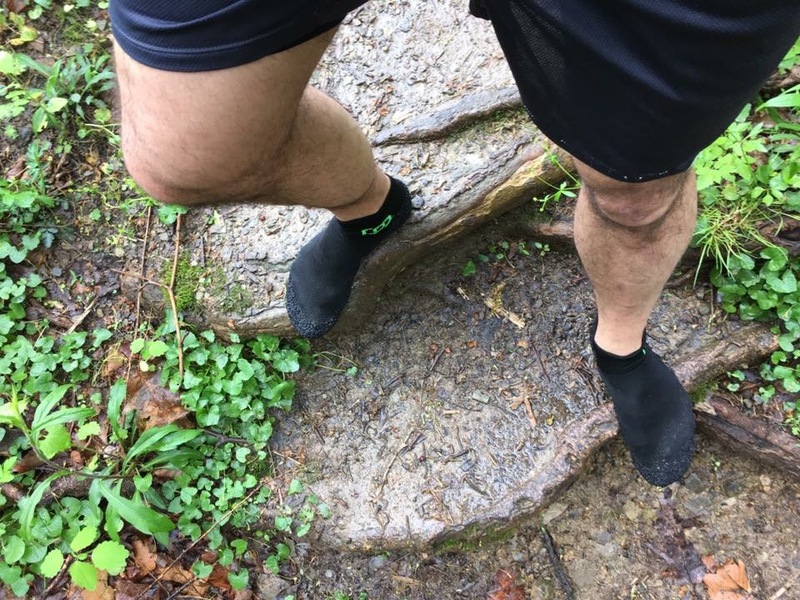 They looked like socks, but were touted as minimalist footwear suitable for running, swimming, and any other thing that may involve your feet as a primary source of locomotion. As I was getting more and more into minimalist footwear I had to try them. I placed an order. At the time the kickstarter price was $35 with production and delivery date unknown and the company was based in Czechoslovakia. I forgot about them for a while and when I remembered I looked up my order info. They shipped, but didn’t leave Czechoslovakia customs and were returned to the company. I wrote Skinners and had them in hand in a week’s time. Finally in hand, it was time to test them out so I hit Fox Chapel for some easier terrain with a mix of trail and road and let it fly. brought a giant smile to my face. It was like being a kid running free and unfettered. There is plenty of ground feel, but also the rubber material, an anti-abrasive polymer on the bottoms, provided grip and padded my feet against small rocks and roots, I stress SMALL. The rocky sections hurt like hell! Hitting the muddy sections I found the grip to be better than many shoes with lugs and far superior to Lunas. I was thoroughly enjoying each splash through the mud and puddles. The temperature was rising and even the simple sensation of cool water on my feet was a blessing. On the return trip I was definitely in pain. Running on that gravel fire road beat my feet up good even with the padding, which is minimal. 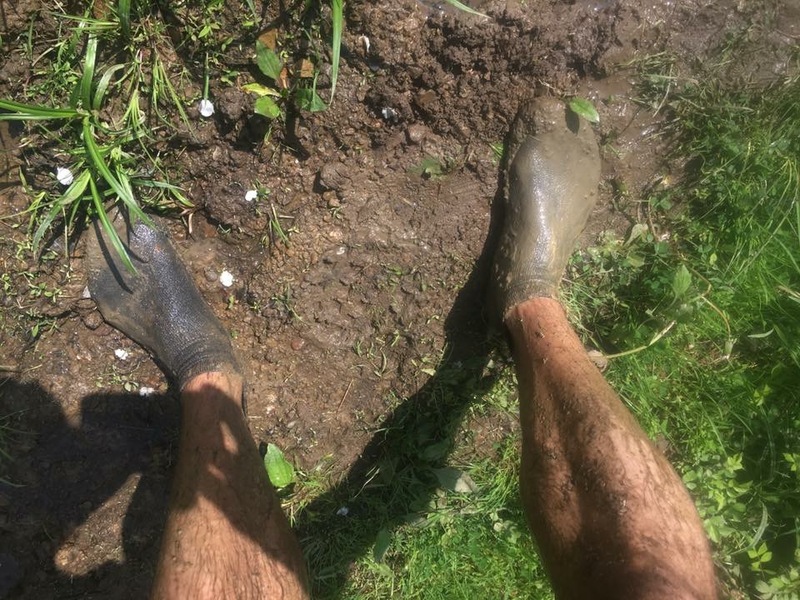 This was not a limitation of the product as much as it reinforced the idea in my mind that I need to toughen my feet up before trying truly barefoot running. Skinners would make an excellent step in that progression if they held up. Since those first two runs I’ve run road and trail in them and find them more and more enjoyable. Also, my feet are getting tougher which only helps. I’ve put over 100 miles on them and see minimal signs of wear. I hand wash and air dry them occasionally and have not noticed any funk. So far the antibacterial material seems to be holding it’s own. At 80 grams in weight you’ll be hard pressed to find a shoe that even comes close. The lightest running shoes are over 200 grams. The downside is the aesthetic. They just look too much like socks. But that is also part of the reason I love them. I am a form over function guy and these function well. If they look a little silly so be it. I have had one injury which would have been prevented if I had worn Lunas or traditional shoes. While running a trail my foot came down on a picker, one of those really dense wooden kinds. It drove up into my foot. Aside from some soreness for a couple of days there was no lasting effect. Overall I rate these high. 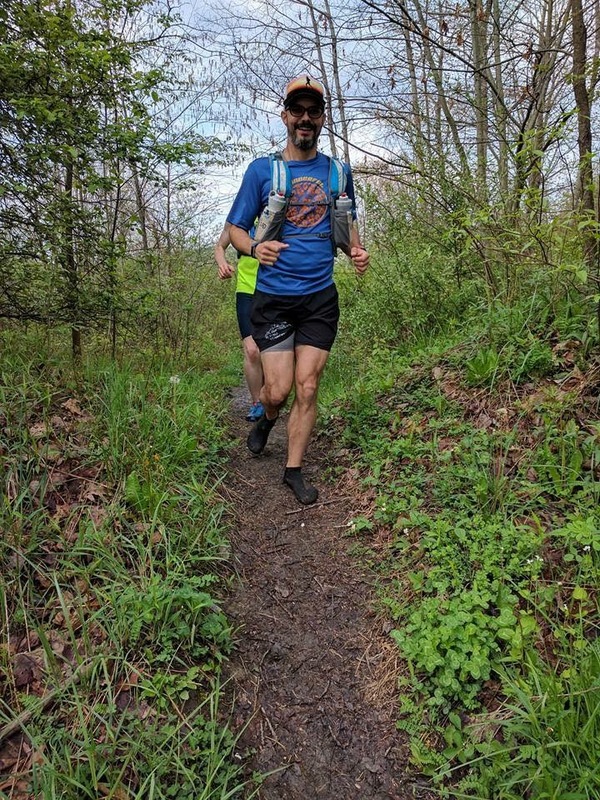 If you are interested in minimal or barefoot running Skinners make a great step in that direction. Next time we will look at FYF (Free Your Feet). 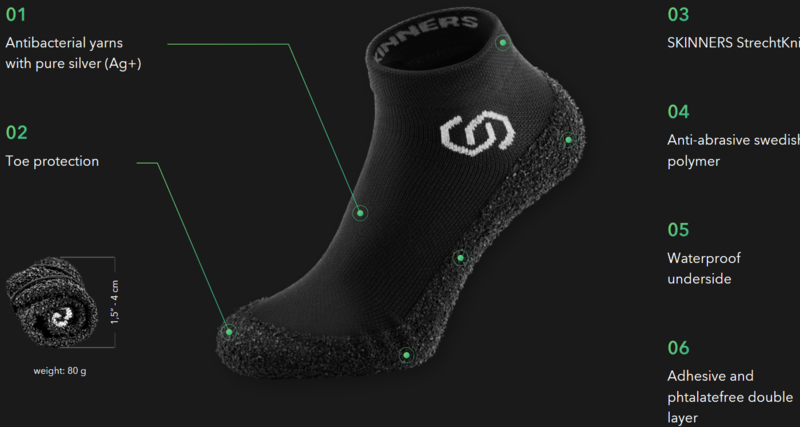 Another innovative sock-like piece of footwear and see if they make the grade.